I love the dainty drops. I am a follower of your blog and I would LOVE the dainty drops- I would get two- one for my husband and one for my son! I'm a follower. I love the mother of pearl necklace. I am a follower and I love the flower and the circle one. I have a boy and a girl and I would love this one!!! I just became a follower, and I love the dainty initial hearts. I love pearls! I love the dainy initial hearts. So sweet and simple! I posted your button on my blog, I'm a follower on facebook and I voted for you on popular mommy blogs. I can't decide if I like the names on my heart one or the a flower and a circle better! I am a follower of your blog and LOVE it! So many creative ideas! Love all of them but my fav is the circle of love bracelet! I love the "circle of Love" pendant! Beautiful!! Just voted on Top Mommy Blogs for Love Actually. Added your button to my blog. If I win I would like the "dainty initial hearts necklace"
Square names on a chain that say Danilo and Brittney, with the little pearl. Because I love him! I love the dainty initial hearts, and the square names with heart. I love this jewelry very much. i love that dainty drops necklace! I just LOVE LoveActually, thanks for all the super cute ideas! I'm a follower and love everything about your blog and what a difference it makes! These are the sweetest pieces of jewerly that definitly can have sentimental value with loved ones names and initials. I love the come fly with me and bitty blossoms. LOVE THEM! Had never previously heard of this company: WOW!!! AMAZING selection!!! Have to say "I love you to the moon and back" is my favorite. That is one of my 3 small children's FAVORITE stories. We love the phrase so much that we had a plaque made with it engraved on it! Even if I don't win, might be requesting this piece for Mother's Day! I like the "Come Fly With Me Necklace"
I voted for you on Mommy blogs. I hope I have a fighting chance! Added you to my faves on fb!!! I am a follower of your blog, on facebook, I have your button on my blog, and i voted for you giving you a 10! I'm a follower! And I think my favorite piece is a cup of love necklace. I have your button on my blog, too! I like Layered Circle of love, and a simple love you will do - these are adorable! I'm a new follower and loving it! My favorite piece is the "Our Family Nest" necklace. I'm a follower! I love Vintage Pearl and I don't know how I would pick just one piece! and I have your button on my blog! and recommend you to my married friends! I love the Vintage Pearl! My favorites are the dainty drops or the simple love with a copper heart. I love "a flower and a circle". What a really simple and beautiful gift. I would LOVE to get something like this for my mother for mother's day. Love these pieces - my favorite would be the mother of pearl necklace. My absolute fave is the circle of love bracelet. I would SOOOOO wear it everyday! Oh man I want it so bad!!! Just ran across this blog and I love it! I love vintage pearl too! If I won, I love the "a simple i love you will do" necklace. ...and I would love the Circle of Love bracelet - so pretty! I really like "I love you to the moon and back." It's such a pretty necklace! Count me in ;) I'm a follower! I love love actually. These are so cute. I would be happy with any of them. Layered circle of love or dainty drops...what to pick. follower! I like the names on my heart necklace! i love LOVE this jewelry! if i win i would love to get the bitty blossoms! My favorite items are the eclectic necklace and names on a ring. There are too many things to choose from!!! Just became a follower. Vintage Pearl has so many cute things but I think I'm going to go with the bitty blossoms. Very simple yet very cute! Am now a facebook fan too! i'm a follower and i voted for you on Top Mommy Blogs. Oh, I'd LOVE this! I'm a follower and my favorite is the "dainty drops" mother's necklace charms. SO cute! Since browsing "The Vintage Pearl", I would love to get the "Dainty Drops" piece. My husband and I adopted our precious baby girl in December, and we had been wanting a baby for four years. I would love to put my little girls name on this necklace and wear it around my neck always. I absolutely love the circle chain bracelet! I would love that! I am most definitely a follower, both of the blog and on facebook! PS I hope you have fun in RI! I am now a follower and my favorite piece is the circle of love necklace. The pieces are ALL beautiful and unique. Thanks!!! yay I'm a new follower! I just looked and I LOVE the come fly with me necklace. I just found this blog and I love it!!! I'm now a follower. I love the "Dainty Eclectic" necklace at Vintage Pearl. Although, it is all so cute! I put your button on my blog...but it's private so can you just take my word for it? I love Names on a Heart! I LOVE dainty drops and Square names on a chain. So adorable! I'm a follower and I put your button on my blog, everyone loves this blog! The Dainty Drops are so cute especially with the dainty drop earrings. I am definitely a follower of your blog .. hang on your every idea!! 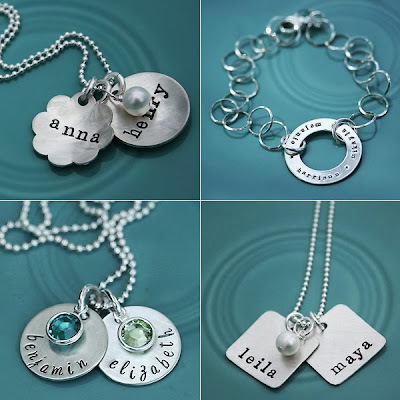 I have an infinity necklace with my childrens' names on it, but I was just thinking the other day how I would like one with just my husband and my name. I love the rectangle charm bracelet and would choose that! I put your button in my blog!! And I love the "Circle of Love" necklace!! I am now a follower of this wonderful blog...and I love the come fly with me necklace, definitely one of my favorites. I am now a follower on facebook, hooray! I think (hope) my vote went through for you on Top Mommy Blogs. I'm a follower! 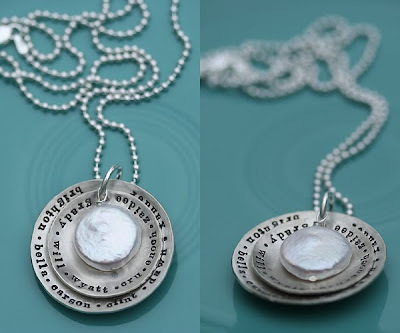 My favorite piece on The Vintage Pearl is "mother of pearl." I voted for love actually on top mommy blogs. AND I'm a fan on facebook!!! SO, that's 3 entries for me I think. I love those necklaces and I really hope I win! Thanks for writing this awesome blog. P.S. I LOVE Love Actually! I am a follower, and I voted for you and If I won I would get Come fly with mE!! but definately love it all!! Dainty Drops works for me! So cool! Love this blog! I am following now! Also following you on twitter and FB too! Your blog was recommended by another blogger at POM's Connect MEme Monday! I love them all... so cute!! I especially like "square names on a chain" and the circle of love bracelet. I have your button on my page and am your fan on facebook. Keep up the good work, i ♥ your blog! I'm a follower. My favorite is the Circle of Love. I love the large layers necklace. So pretty! I love the little hearts with the initials. so cute! I LOVE the Blog count me in, I like so many of them. The one with all the shapes, and also the flower and circle are a couple favorites. and your button has been posted for a long time!! I LOVE the Dainty Layers Necklace--- SO CUTE! i'm a follower. i definitely love the mother of pearl! 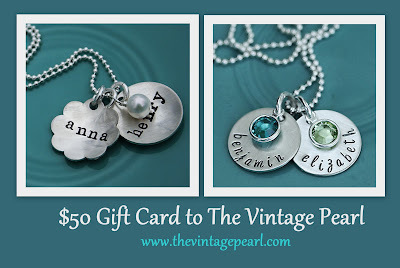 I love the "square names with heart" from vintage pearl! I'm a follower! My favorite piece in the Dainty Drops (name circles topped with birthstone charms). So cute! I love the "a flower and a circle" necklace!! !